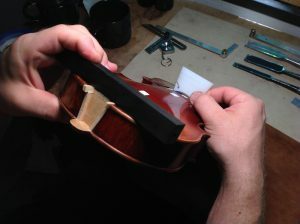 A neck-reset is a common repair for most shops. In order to do the job properly, a thorough knowledge of the materials and processes involved is required. Because the subject is too large and difficult to comprehend in one sitting, it will be split into multiple parts. 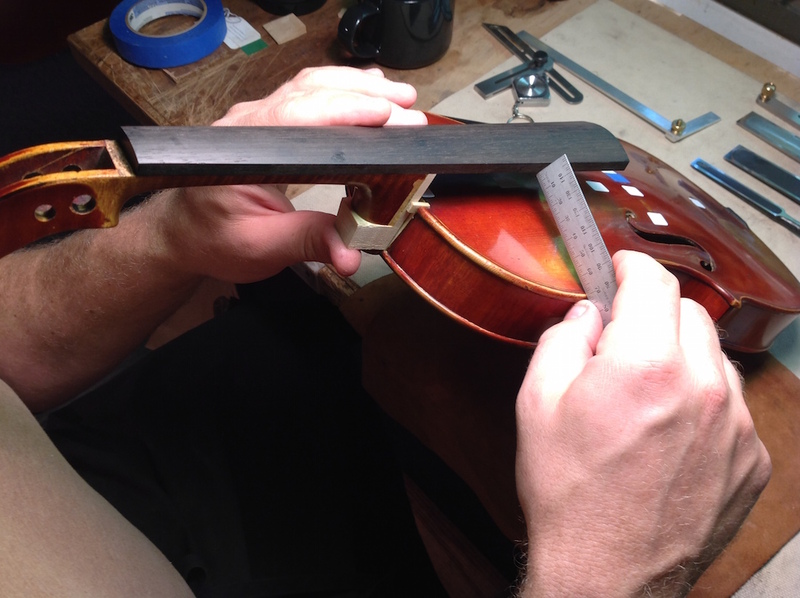 Click here to revisit the article, “Resetting a Neck, Part 1“. This article, Part 2, will review whether a neck reset is necessary and outline all the steps involved. 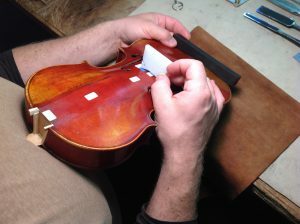 Steps 4 through 12 will be covered in more detail, including adding pieces to the neck-foot and preparing to set the neck into the violin. -The appui is too short (The appui is also referred to as overstand). 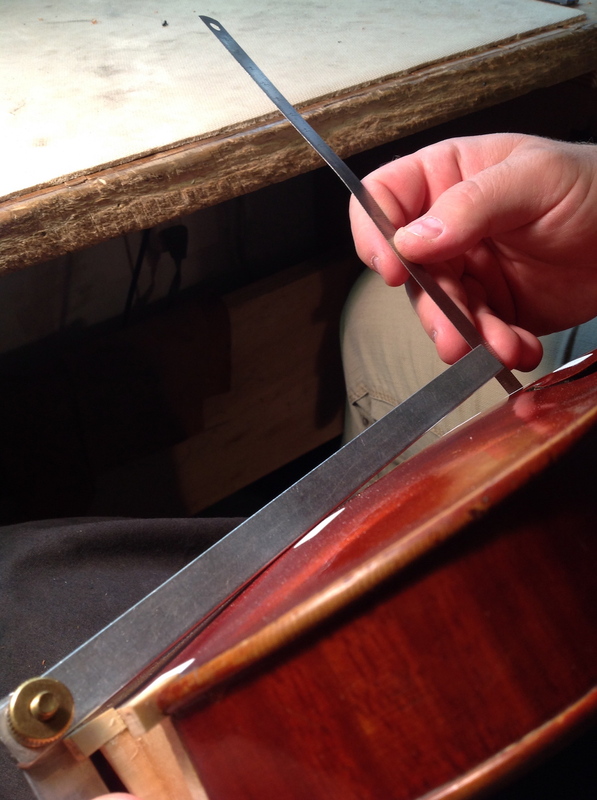 Measured at the foot of the neck, it is the distance from the top plate edge to the fingerboard. 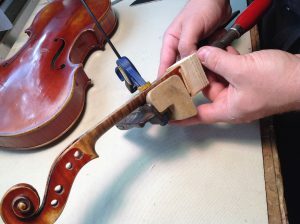 A higher appui adds a sense of ‘stickiness’ of the bow to the strings, and can also help with the clearance for the left hand moving into upper positions. 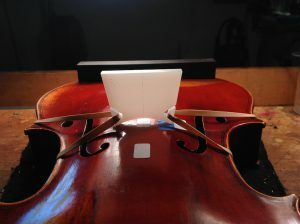 -The projection is too low (The projection is the angle the fingerboard and neck is set in relation to the instrument). Click here for a photo example. -The poirette needs to be corrected (The poirette is the twist in the neck set that favors the bass or treble side). -The neck is not centered. -The neck has broken out (It’s not enough to simply glue it back in). -The neck length needs to be corrected. Release the neck if it is not broken out already. 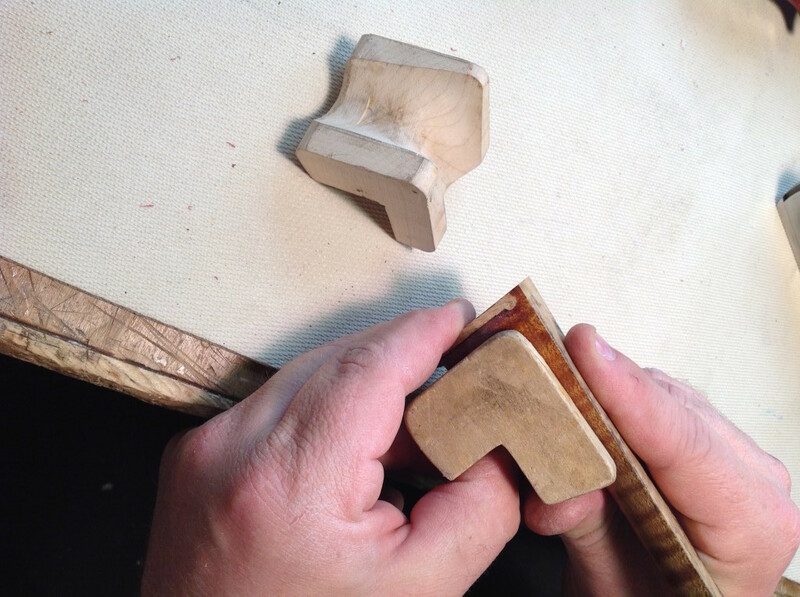 Select, fit, and glue maple and spruce wood pieces into the mortise as needed. This can be done while the glue is drying on other steps. Select, fit, and glue a piece of matching wood on the bottom (endgrain) of the neck-foot. Select, fit, and glue a piece of matching wood on the back (button) of the neck-foot. Fit a new soundpost, if needed. 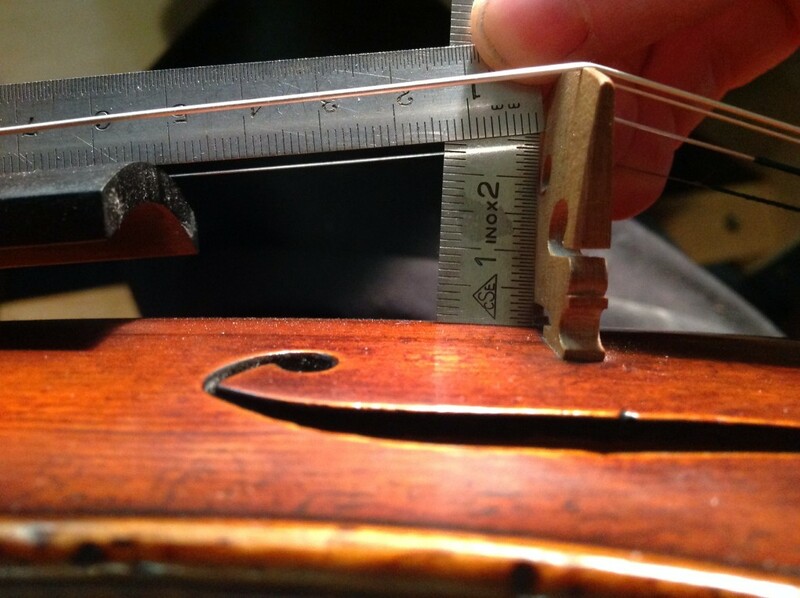 Measure the fingerboard projection by itself and establish the angle at the bottom of the neck-foot. Cut the angle and plane flat. Spot glue the fingerboard on the neck. Find the corrected position of the bridge by assessing the twist in the instrument body. Do a mock neck setting and determine if and where a neck-foot side piece will be needed. Select, fit, and glue a side piece on the neck-foot if needed. Remove the fingerboard. Plane the sidepiece to match the already established angle of the bottom of the neck-foot. Glue-size the bottom of the neck-foot, add pins in bottom and back pieces of the neck-foot, and spot glue the fingerboard back on. 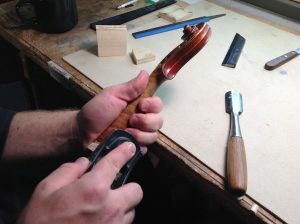 Remove the fingerboard once again, color the exposed bottom of the neck-foot, and permanently glue on the fingerboard. 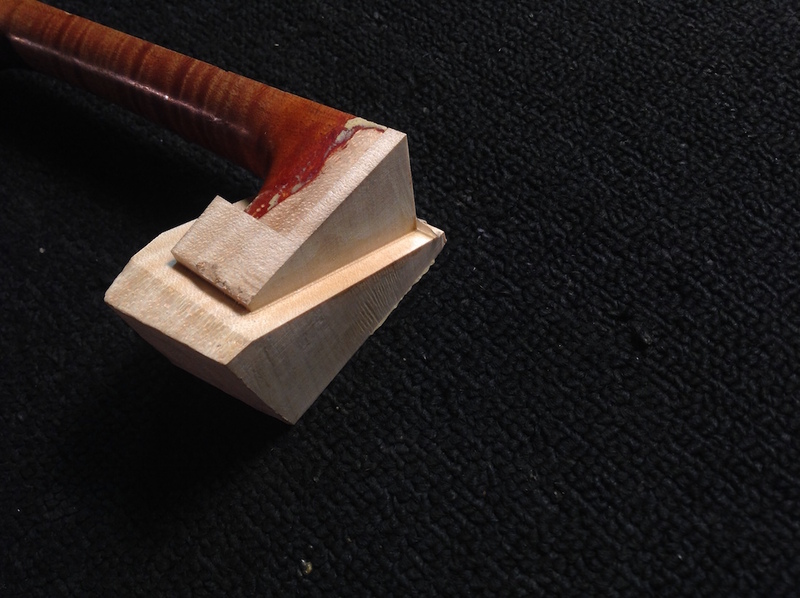 Establish the neck heel compass, shape the heel, and blend into the existing neck. In this article I will only be covering steps 4 through 12 of these operations in detail and I will address the remaining steps in a future article. Steps 1 through 3 are covered in “Resetting a Neck, Part 1”. 4. Select, fit, and glue a piece of matching wood on the bottom (end grain) of the neck-foot. 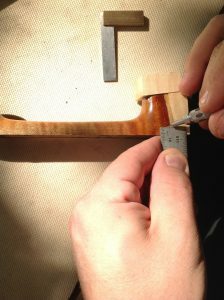 First, plane the bottom of the neck-foot with the button-end of the neck heel against the bench, see picture below. As with all the steps, having a very sharp blade is necessary. I have 2 Veritas block planes. One is a low angle and the other is a standard angle. On the standard angle plane I have an O1 blade sharpened to a steep angle of 37 degrees. 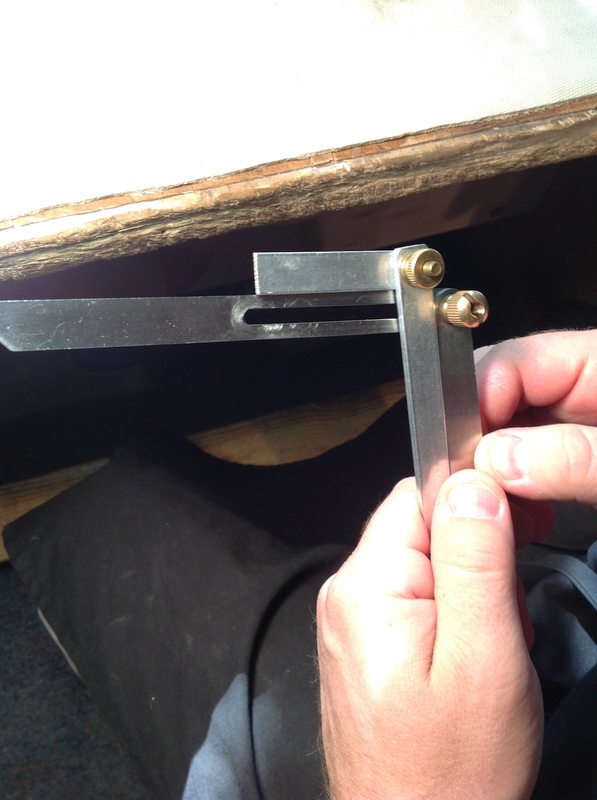 On the low angle plane I have PMV-11 steel sharpened to a more acute angle of 25 degrees. Having the two planes with different setups is useful for different tasks. In the case of planing end grain, like the step described above, the low angle plane does a better job as a lower cutting angle cuts through the end grain fibers more easily. Once the neck-foot is flat, select a piece of maple that is a close match. Orient the piece of wood so that it matches the grain lines and flame of the neck foot, and fit and glue a piece of plywood opposite the final gluing surface. The point of the plywood is to stabilize the maple for gluing to the neck-foot and should be easy to remove later. The plywood backing is just spot glued onto the maple piece with about 5 dots of superglue. Flatten and fit the new maple piece to the neck-foot. 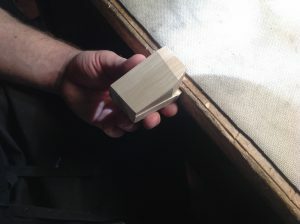 Still using a low angle block plane, plane the piece while holding it against the bench, much like planing the neck-foot. When both pieces fit, they should feel ‘sticky’ when you rub them together. To explain this in text is difficult, but in the video below, you might be able to see and hear how the fit should be. If the fit is not right, check with a “knife edge” straight edge to look for any irregularities that need to be addressed. 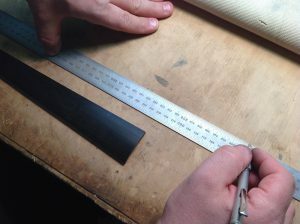 When people are having difficulty getting the fit right, the problem is usually with the plane blade. Make sure it is extremely sharp, a slight convexity to the blade will help as well. The next step is lining up the medullary rays. 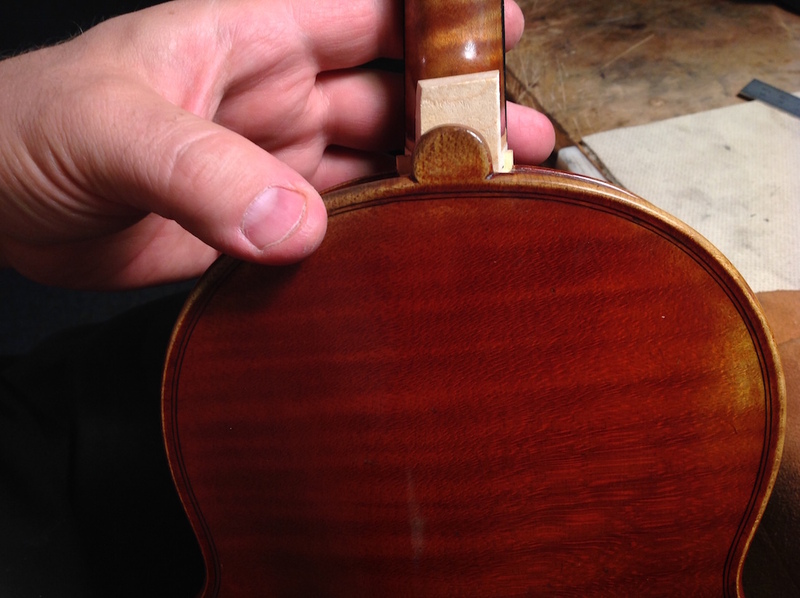 Medullary rays are a factor that many violin makers and restorers do not know to take into account, let alone take the time to line up properly. However, matching the medullary rays goes a long way toward a successful touchup, and not matching them make a convincing touchup quite impossible. Medullary rays are vessels that radiate out from the center and are essential in the feeding of the tree. Wood scientists refer to them simply as rays. The medullary rays can be seen as dots, streaks, or lines depending on the surface being viewed. 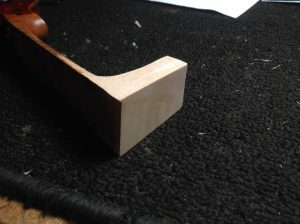 When looking at end grain they show up as tiny white lines. Lining up the rays on the two pieces of wood when viewing the end grain will ensure that the orientation of the pieces match. 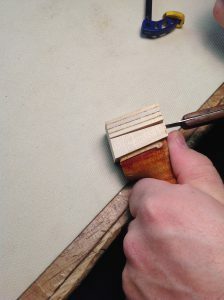 Once the orientation is determined, draw a pencil line around the neck-foot for quick placement when the glue is wet. As always, place pencil lines outside of the final surface. Pencil lines will show up black in any context telegraphing exactly what we spend so much time to visually minimize. 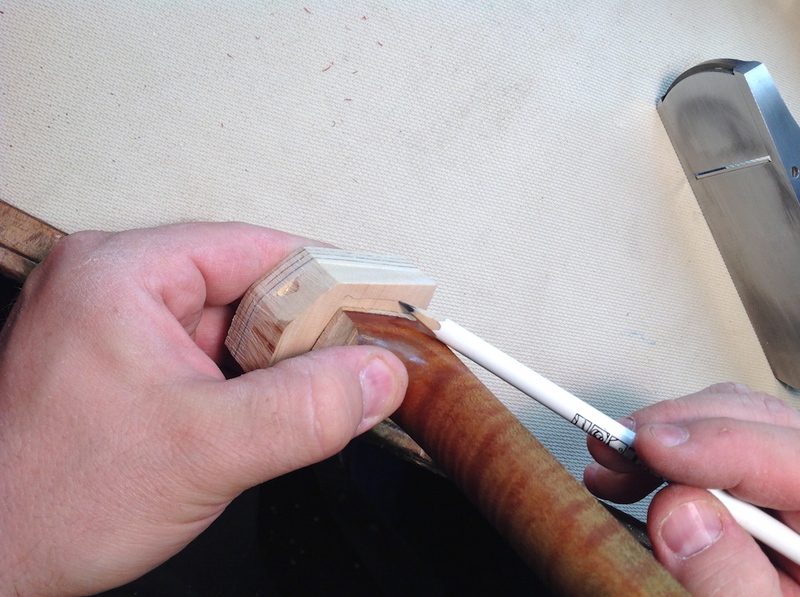 Use or make a well fitting caul to support and protect the neck while gluing the bottom piece to the neck-foot. I use Titebond for this application. It’s one of the few procedures in this business where I think it is okay to use a glue other than hide glue. 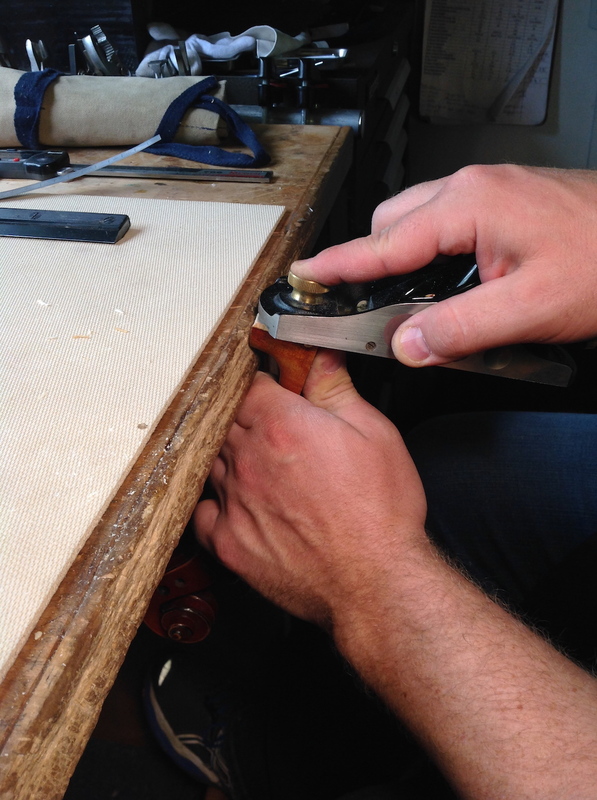 Titebond is a better choice when gluing end grain to end grain as hide glue is too thin and will soak into the wood. It would be possible to glue-size the surfaces ahead of time, but multiple glue-sizing sessions along with refitting would be necessary and still wouldn’t guarantee a good bond. Titebond is thick enough to not soak in and will hold very well. 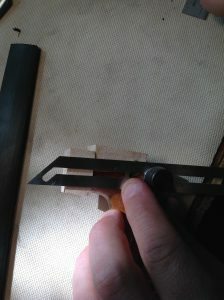 Use a Quick Grip clamp to hold the gluing caul in place. Put Titebond on both surfaces; apply glue the old wood first and then the new. It’s not as necessary when using titebond, but in restoration it is a good practice to apply glue to the old wood first since it is less likely to distort and move around with the added moisture. Clamp the pieces together and clean off all the squeeze out. Finally, go back and apply a bead of glue around the joint with a toothpick. This helps counteract the fact that the glue is drying faster on the outside of the joint than the inside. Let the joint dry thoroughly for many hours. 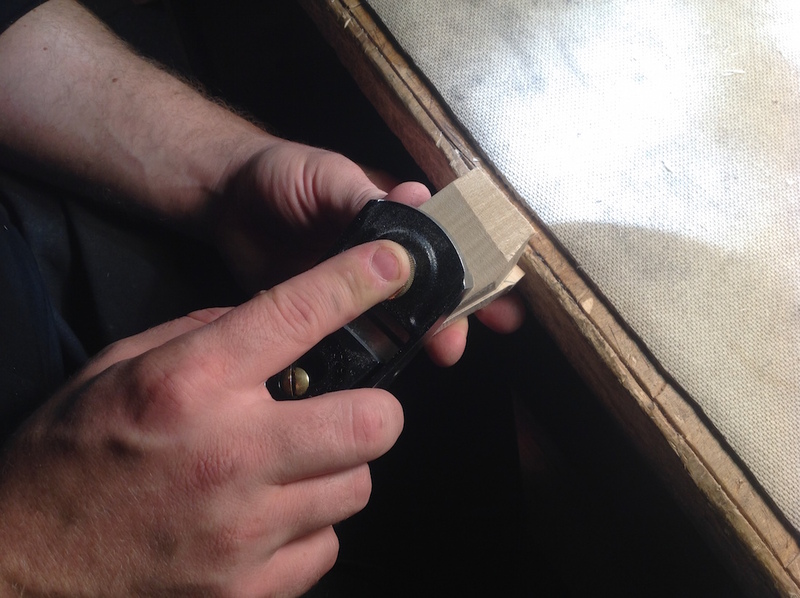 After the glue is dry, remove the plywood backing with an opening knife. 5. 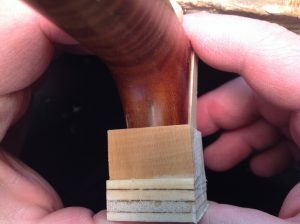 Select, fit, and glue a piece of matching wood on the back (button) of the neck-foot. Start by planing the back of the neck-foot flat. 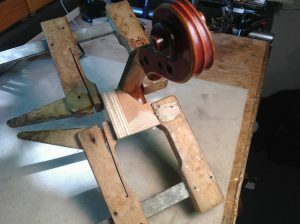 It is tricky to get the neck-foot stable enough for planing, but if the neck is held in the non dominant hand and braced against the bench, it can be a relatively easy task. Find a suitable piece to add to the back of the neck-foot. 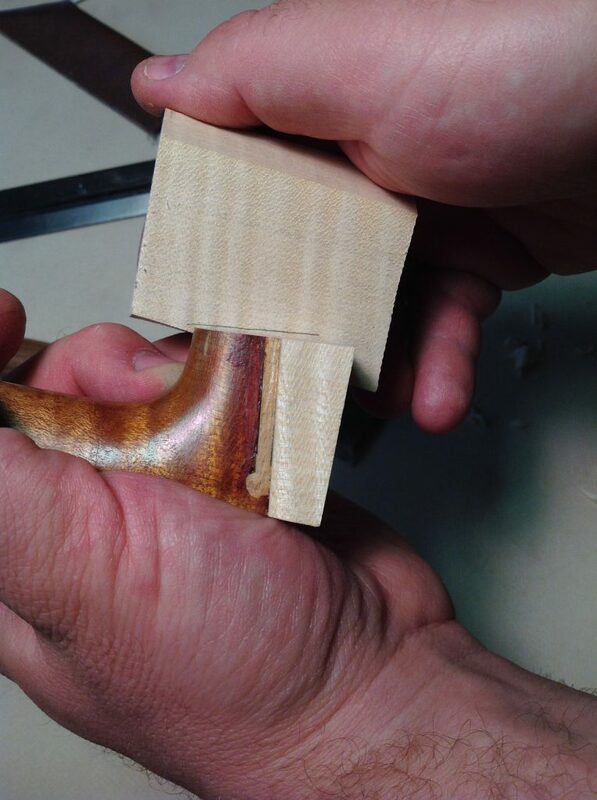 Often it is a cutoff from the wood used for the bottom piece. Just like with the bottom piece, the wood is oriented so that the medullary rays match first, followed by the flame, and finally the grain lines. 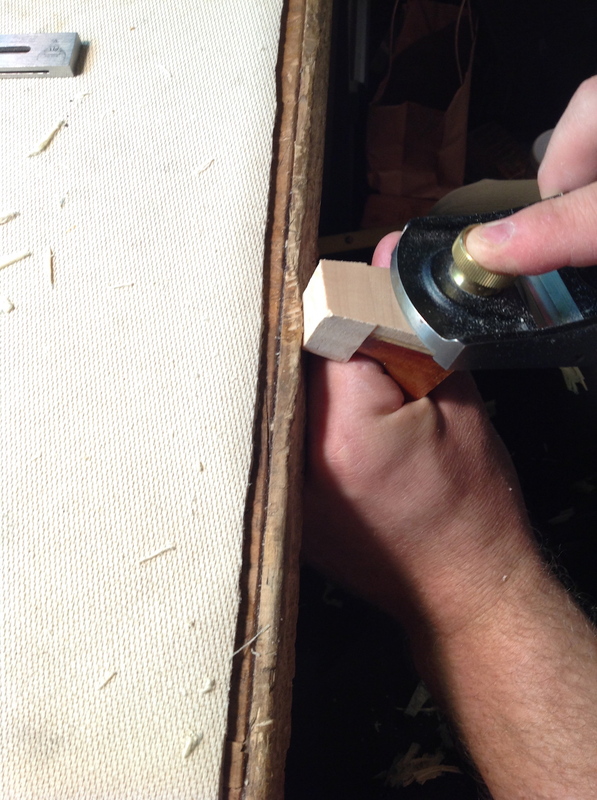 When the piece is properly oriented, spot-glue a plywood backing as before. 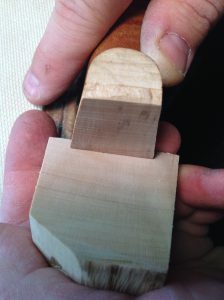 Fit the new piece to the neck-foot using a block plane, and as before, use a “knife edge” straight edge to check the surfaces for irregularities and rub the pieces together to diagnose the fit. 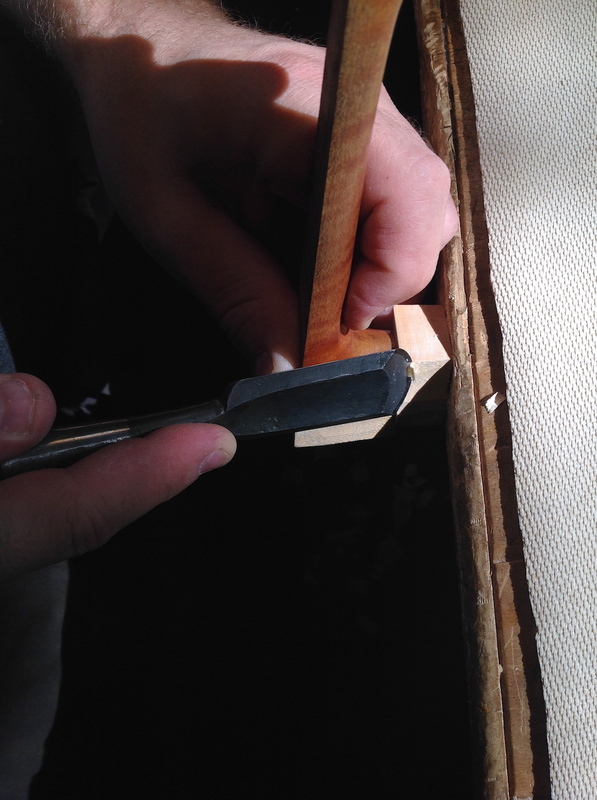 Once the fit is satisfactory, apply hide glue to the old wood first, and then the new and clamp the pieces together. Let this dry overnight. 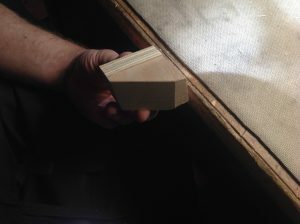 Split the plywood backing off with an opening knife and do a little trimming. 6. Fit a new soundpost, if needed. Measure the fingerboard projection by itself and establish the angle at the bottom of the neck-foot. 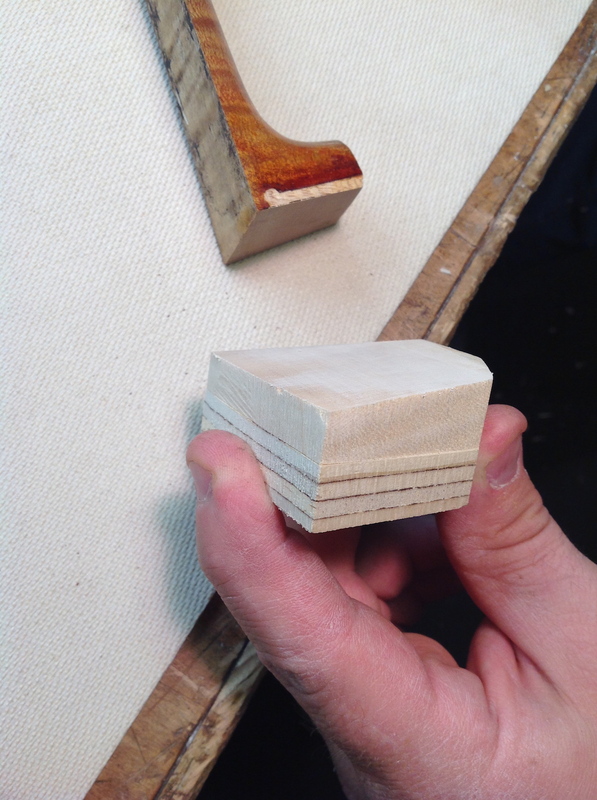 Cut the angle and plane flat. At this point, fit a new soundpost if needed, it usually is. 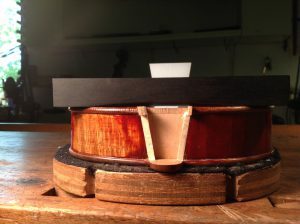 The soundpost will often alter the top arch slightly and it is important to have the body of the instrument be as close to the condition it will be when set up. 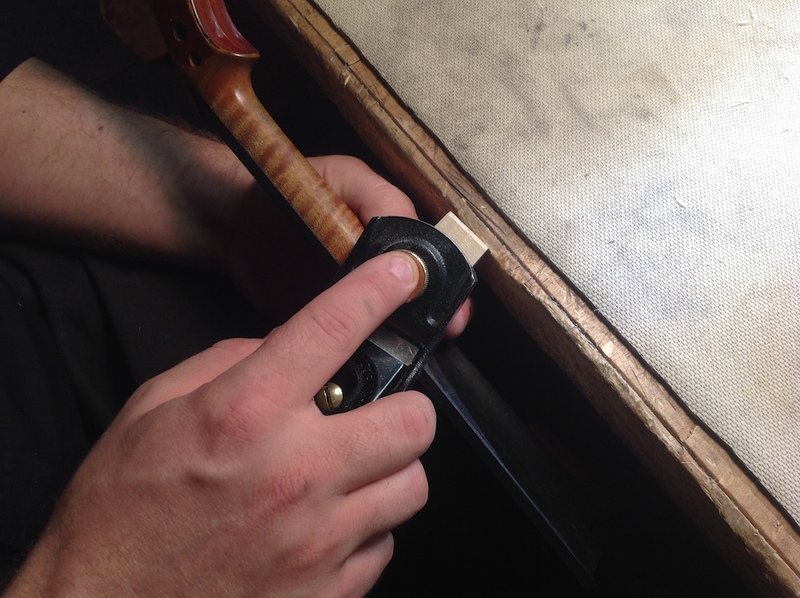 At this time, measure the projection of the fingerboard alone. To do this, mark out the distance of the neck length plus the diapason (or stop length) on the bench. For violin that is usually 130 mm plus 195 mm. Place the fingerboard nut end at the first mark and place a straight edge on top of the fingerboard. At the second mark, measure the projection of the fingerboard alone and write this number down. To calculate the projection without the appui and fingerboard, take the overall intended neck projection (27.5 mm) and subtract the projection of the fingerboard alone (in this example 11 mm) and the intended appui/overstand (6.5 mm). So: 27.5 mm – 11 mm – 6.5 mm = 10 mm. 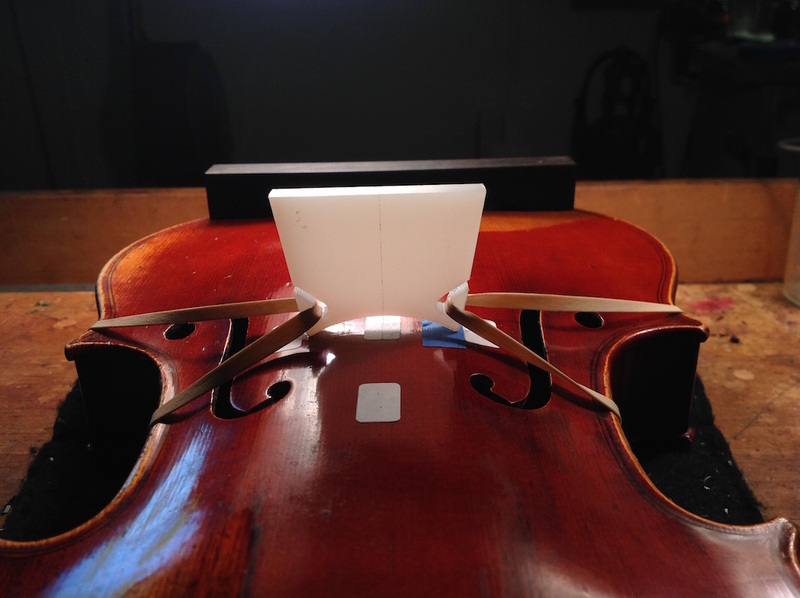 Using this new number, plot out the new neck foot angle by measuring this projection at the bridge line on the instrument body. Rest the angle gauge on the back overhang, the top overhang, and the top edge while projecting the 10mm at the bridge. Transfer that angle to another T-bevel to find the supplementary angle (supplementary angles equal 180 degrees), and lock the T-bevel and set it aside. At this point I will also trace the angle of the T-bevel onto a piece of paper as a reference. Next, mark a line on the neck foot at the appui: 6.5 mm from the neck/fingerboard gluing surface. Hold the fingerboard up to the neck with the nut end sitting 1.5 mm below the cul de poule (some call it the chin) of the scroll and draw a pencil line on the neck so the fingerboard position can be referenced later. Establish the neck length by holding the fingerboard in position and measuring from the point of where the fingerboard top surface meets the nut, down to the line that was marked earlier for the appui. Make a mark at 130 mm. This is the spot where the edge of the top plate will meet the neck foot when the neck is set. 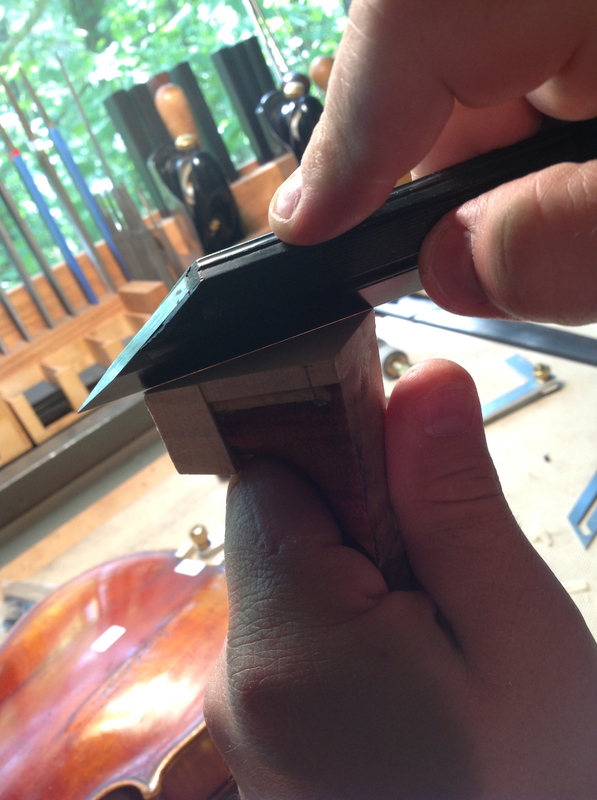 Measure the edge overhang of the top plate at the treble side of the neck mortise. Usually this is a number somewhere around 2.5 mm for violin. 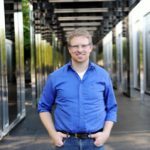 If the edge overhang is distorted and the ribs need to be redistributed, do so before taking the edge overhang measurement. Add the overhang measurement and the 6 mm projected depth of neck mortise to the earlier neck length mark and at this point, with the sliding t-bevel as a guide, draw a line indicating the angle of the neck foot. Cut the excess off with the bandsaw, finish off the surface with a block plane, and check for flatness with a “knife edge” straight edge. 7. Spot glue the fingerboard on the neck. 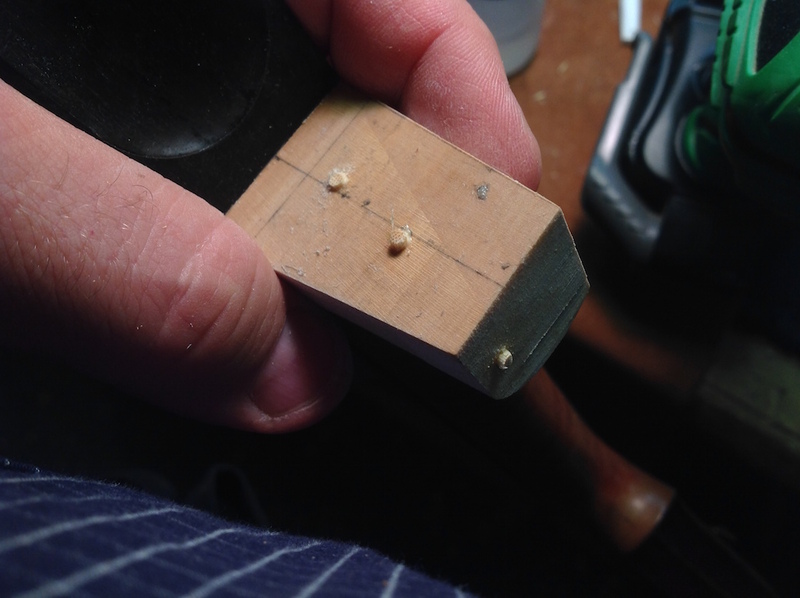 Using three small dots of hide glue for this if time permits, clamp the fingerboard in place using the mark made earlier positioning the fingerboard 1.5 mm below the cul de poule. 8. 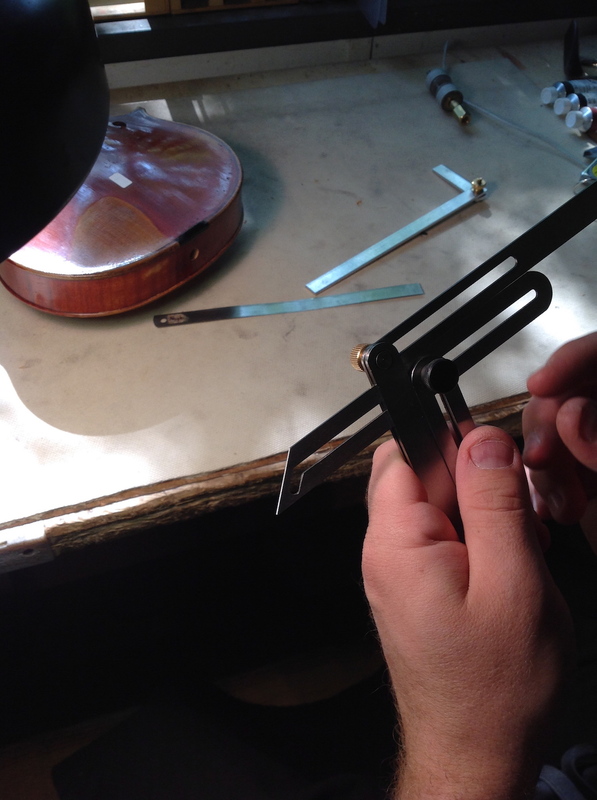 Find the corrected position of the bridge by assessing the twist in the instrument body. In this step we are compensating for any arching distortion or twist in the instrument body. if a future restorer wants to correct any of the twist or distortion, the neck set will be based on the instrument body being at an equilibrium. In new instruments this is rarely a problem, but with instrument of age, there is almost always some sort of distortion. 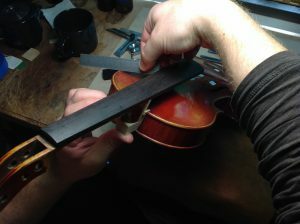 I use two helpful jigs for compensating for distortion in the body and for assisting in setting the neck: A plastic mock-bridge, and an ebony stick with the middle recessed to allow it to sit evenly on the edges of the instrument. Both the mock-bridge and the ebony stick are at a dead even height along their lengths. 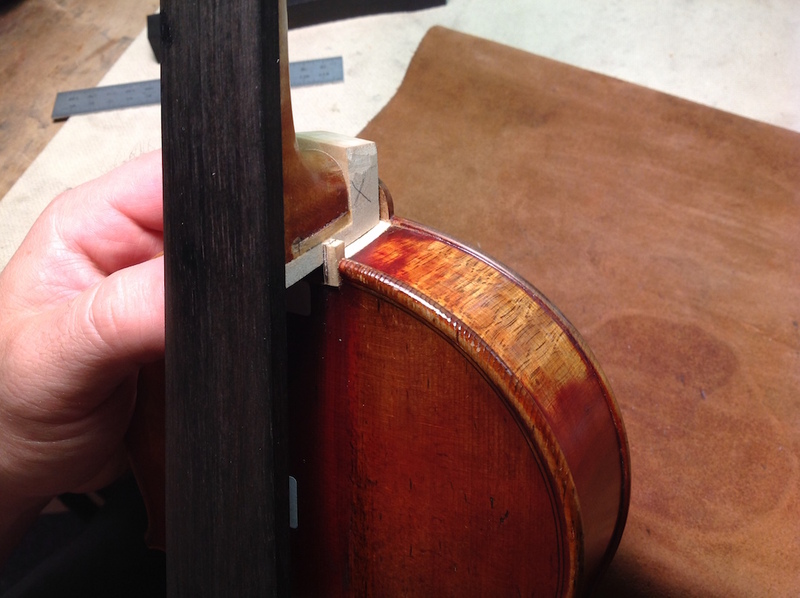 It is possible to do this step without the ebony stick and just reference the edges, but I found the contrast of the ebony and the white mock bridge make it easier to see how things are lining up. I place the plastic bridge in the center of the instrument and rest the ebony stick on either end of the instrument’s edge. 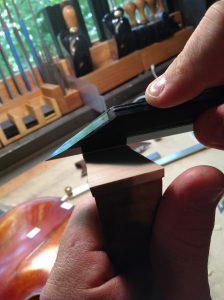 Sighting-down the instrument and looking at the top edges of the mock-bridge and ebony stick, I take notice of how they line up. Then, when putting the ebony stick on the opposite end, I take notice how these two are lining up. 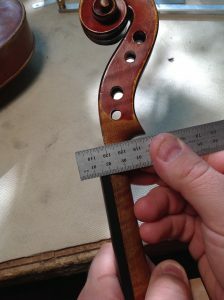 This comparison allows me to see if there is a twist in the instrument body that is favoring one side or the other. Compensate for this twist by raising the appropriate side of the bridge (usually the bass side for obvious reasons) using small deliberate thicknesses of painters tape adhered to the top at the bridge foot, and doing the comparison and compensation once again until the deviation matches while sighting from both ends. I usually do this step by holding the mock-bridge and ebony stick in my hands as the previous pictures show, but I added the following two pictures for a reference of what it looks like to site down the instrument. 9. Do a mock neck setting and determine if and where a neck-foot side piece will be needed. In this step we will determine if the neck foot will need a side piece or not. A side piece will asure the neck foot will line up with the button properly. In the past, some restorers would just cut the button where It was needed and add an ebony crown. Now, however, with conservation of the original in mind, this practice is no longer done. The neck is freely altered as a “replacable part”, but the button is not inherently replaceable. In part one of the neck set articles, I talked about gluing the small spruce pieces as top extensions, and mentioned that I leave a little extra material for the later mock neck set, this is the where that extra material is necessary. For the mock neck set I will not be setting the neck into the mortise, but rather positioning the neck on top of the mortise with the little extra long spruce tabs holding it in place. 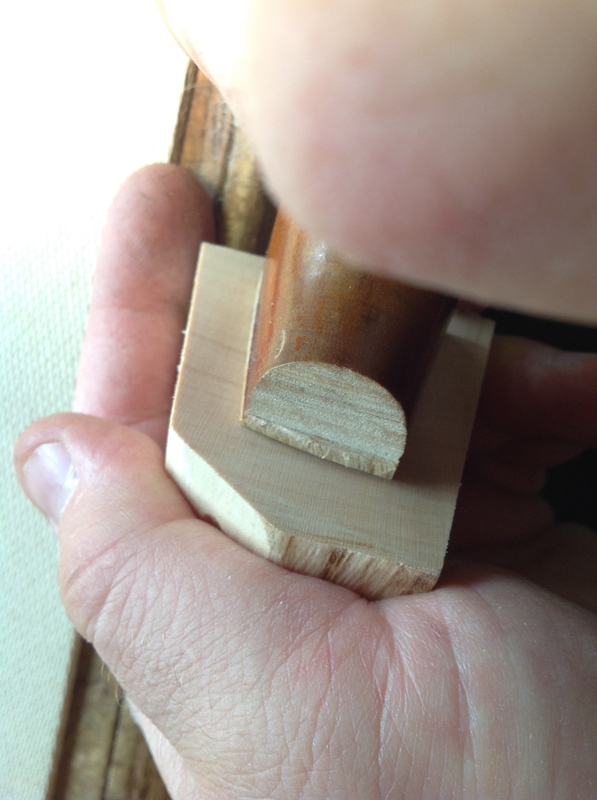 To begin, reference the mark that was made earlier to indicate the center of the mortise. 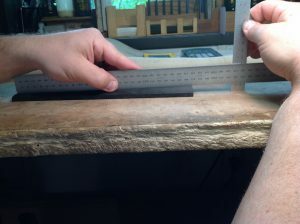 Measure and mark equal distances from the center onto the tabs (usually start with a smaller mortise measurement, approximately 13mm on each side). Using a knife, trim back the tabs, leaving extra room for adjustments. 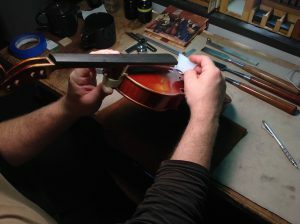 Next, take the neck and place it gently between the tabs. At this point we are not concerned with the projection, but we are concerned with how the outside edges of the fingerboard line up with the bridge when sighting down the neck, where the poirette sits (neck tilt) when sighting toward the mock bridge, and how the fingerboard is centered between the upper bouts. 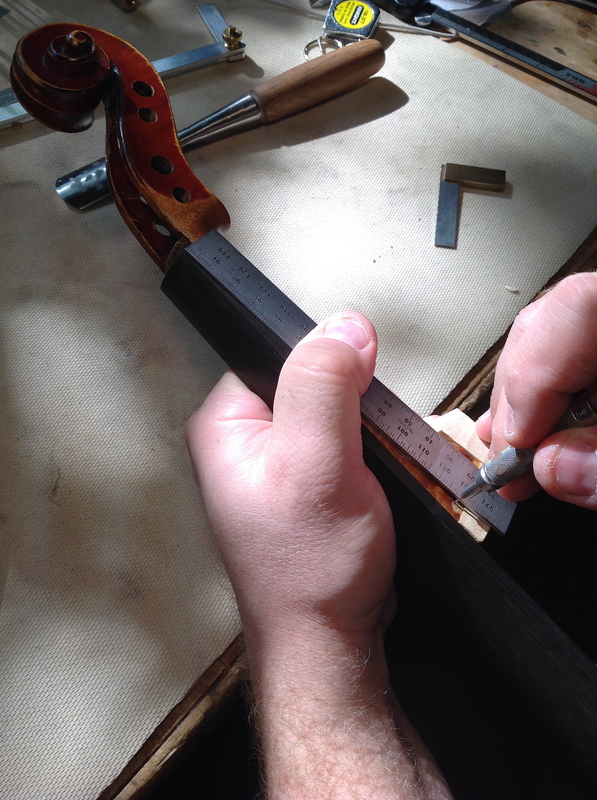 The measurements on either side of the neck are measured from the fingerboard to the inside of the purfling. (reference picture, or label picture with this last sentence) For the poirette, I am looking for the G side of the neck to be slightly higher (1/2 mm – 1 mm) than the E. I have a reference line etched into my mock-bridge to be able to figure out where the poirette is sitting. A slightly higher G does a few things and for some restorers this is a hot button topic. In my opinion, a higher G makes the ergonomics of playing a little easier by allowing the elbow of the player’s left arm relax a little as the player does not need to bring his or her elbow around quite as far to get their left hand into position. Also and probably more importantly, it affects the sound of the instrument. The E string has the most tension by far of all the strings, and lowering the E string tension in relation to the other strings is almost always a benefit to the overall sound in my experience. Of course there are other considerations such as bow clearence and player needs, but what I am giving here is the standard poirette that I aim for in most cases. 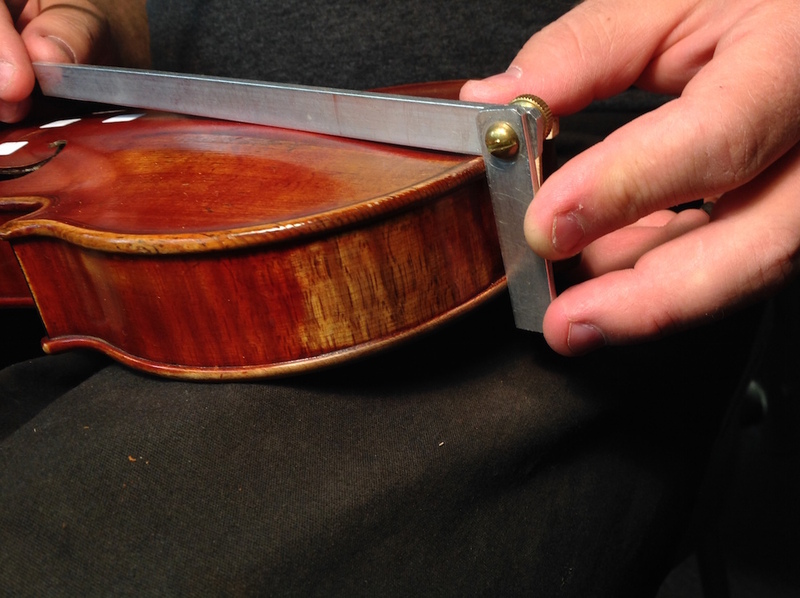 For viola the poirette is set evenly and for cello the “A” is set 1mm higher than the “C”. 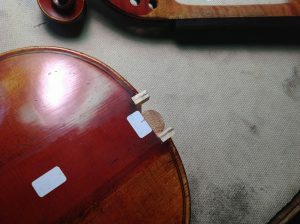 For cello the reasons are mainly ergonomic, while with the viola there are bow clearance concerns. At this point, make adjustments to the spruce tabs if needed and move the neck around until the side to side numbers are on, the poirette is right, and the sides of the fingerboard line up with the bridge. When satisfied that the alignment is close enough to know what is happening with the neck, check how the neck foot is lining up with the button. In the case of this instrument, the neck foot is not lining up with the button and a side piece is needed. Clearly mark an x on the side where a piece is needed and proceed to the next step. Sometimes a side piece is not needed or it is very close and the back piece can be flared slightly to meet the button. 10. Select, fit, and glue a side piece on the neck-foot if needed. 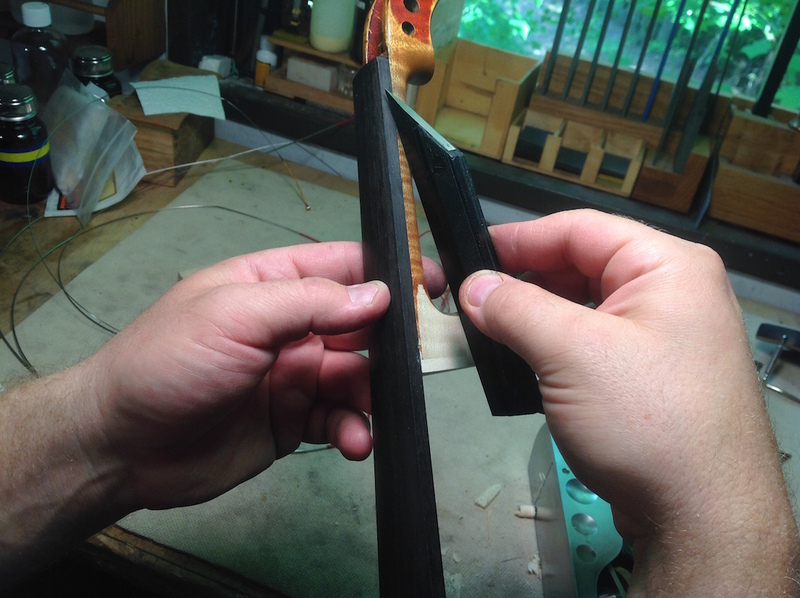 Start by planing the neck foot where the side piece is needed. Periodcally check with a straight edge against the side of the fingerboard (reference the photo) to be sure you are maintaining a good angle that matches the side fingerboard. 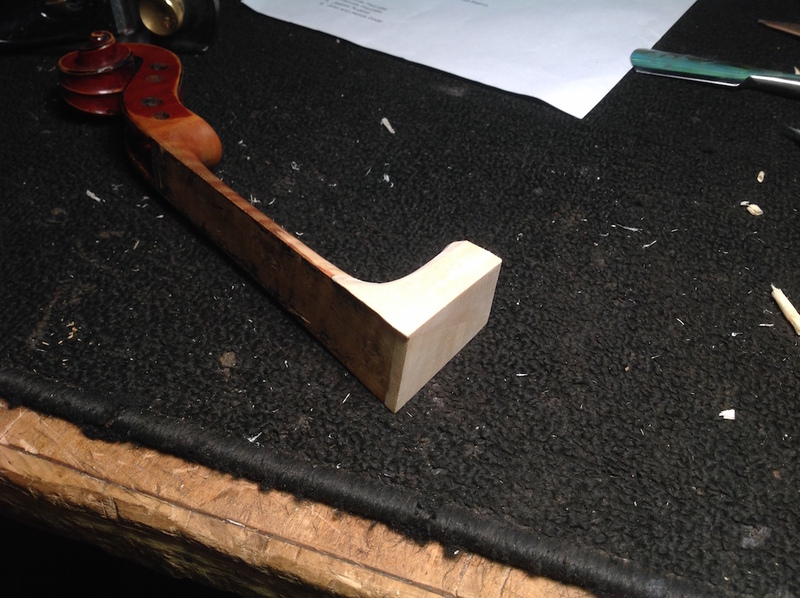 Plane away enough material to assure there will be no holes in the neck heel once the shaping occurs. This usually means going through half the width of the neck foot. Now, choose a piece of wood that closely matches the neck foot, orient the piece appropriately and glue a plywood backing as earlier. 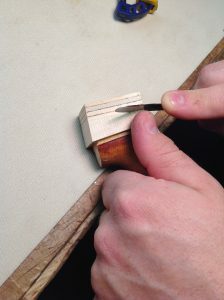 The final fittig is done entirely with hand plane. Once again lining up the medullary rays is important and in fact, probably more important with the side piece than the other pieces added to the neck foot. How well a side piece is hidden in the end product often comes down to how well the medullary rays were matched up. The fit is also extremely important on the side piece. 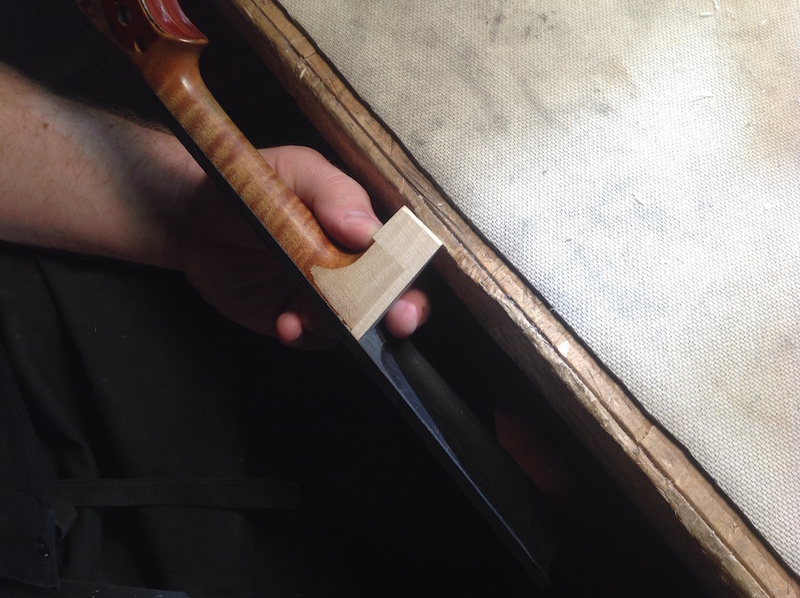 I will often go back and address the surface I planed on the neck foot and check both gluing surfaces with a knife straight edge. I will also feel how the pieces are rubbing together and note the amount of friction between them (which says a lot about the fit). Once I am satisfied with the fit, I will glue the piece on with hide glue. 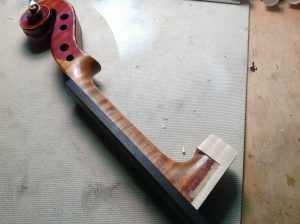 Apply glue to the neck foot first followed by the side piece, clamp things up, and let this dry for several hours. Usually I plan my day so that I can glue this overnight. 11. Remove the fingerboard. Plane the sidepiece to match the already established angle of the bottom of the neck-foot. 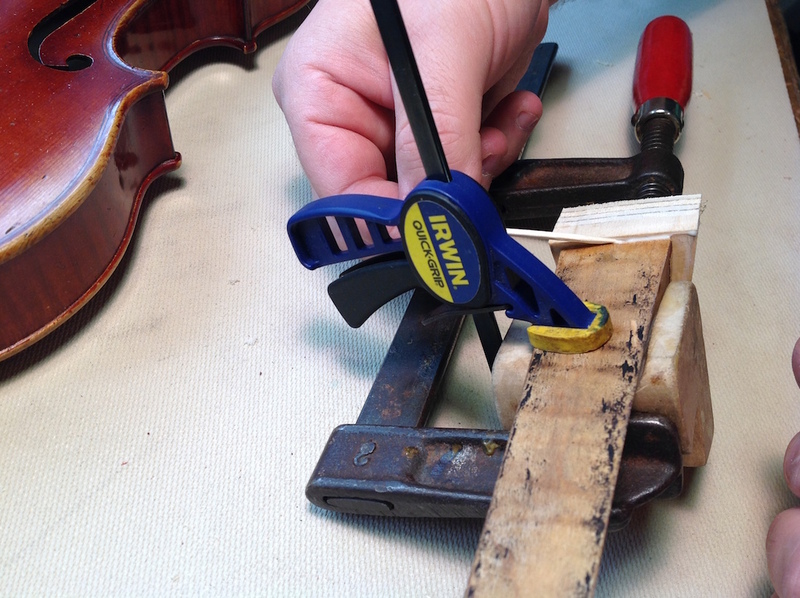 Once the glue is dry, remove the clamps and do a little trimming. At this point I will remove the fingerboard with an opening knife like I mentioned in Resetting a Neck, part one (although it should be easier because it is only spot glued). 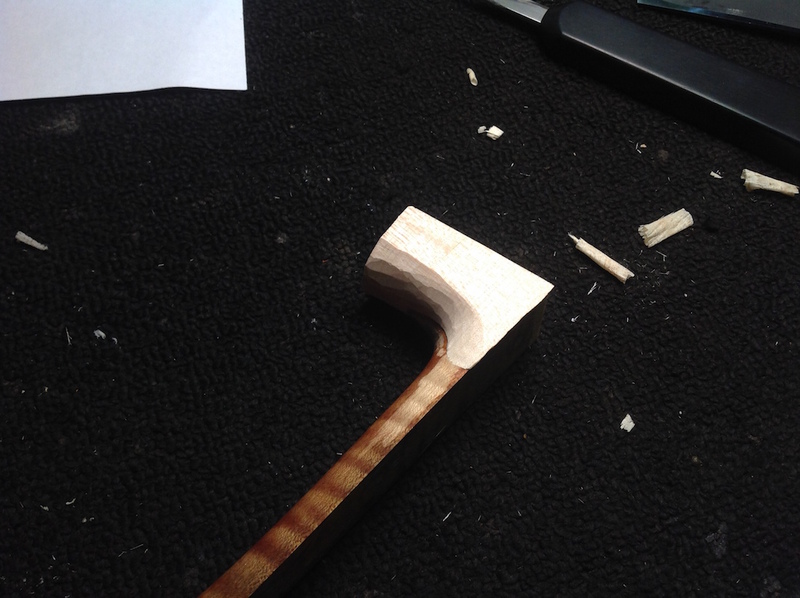 I will trim the bottom surface of the neck foot to match the angle that I established earlier. I do this with a low angle block plane. If there is a lot to remove, I might take a little off with the bandsaw first. 12. Glue-size the bottom of the neck-foot, add pins in bottom and back pieces of the neck-foot, and spot glue the fingerboard back on. Pinning the bottom piece and the back piece to the neck foot is a relatively easy task. Bamboo skewers from the grocery store seem to work pretty well for this step. Simply drill a hole the size of the skewer 4 or 5 mm into the original neck foot. I do not drill straight in but try to angle the holes slightly because they will hold better. I usually use a foret for this task, but a hand drill of any kind would be just fine. Glue the skewers with titebond and break them off. Once they are dry, trim them with a chisel. 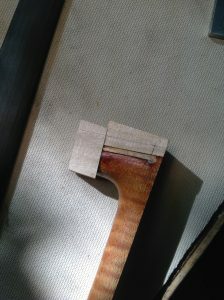 The next step is to glue-size the endgrain on the bottom of the neck foot with hide glue. I find it helpful to put a clamp back on the side piece while glue sizing, as I have had the joint separate while glue-sizing without a clamp. Finally, spot glue the fingerboard back on just as before with three small dots of hide glue. In the final article, I will cover steps 13 through 16 in the order of operations.